Map 3 considers some of the early decisions that must be made, typically in the first session with a patient. Each step in the process is helped by maintaining a positive relationship with the patient or patients [Section 11]. The map is roughly divided into three parts on the right. The first part, shown as Section 18 and Section 19, has to do with choices to be made immediately, in the session. These include the choice of information to pursue, startup goals, and who should be the therapist [Section 18]. Section 19 considers financial considerations, scheduling, and some rules for proceeding. The middle part of the map [ Section 20, Section 21, and Section 22] consider the gathering of additional information from outside sources. 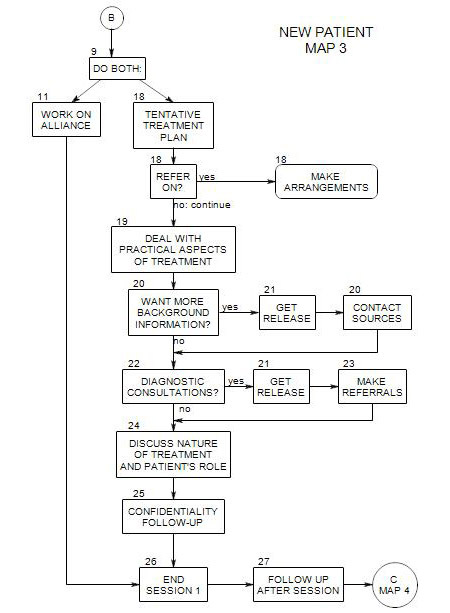 The roles of patient and therapist are discussed in Section 24 and confidentiality in Section 25. These discussions should clarify the treatment process and make it easier to proceed. Then we move on to greater focus in Map 4 and other diagnostic and treatment maps.